Something that stays in your mind will someday spring up in your life. Only 7 tables, plus the lack of 400KB code, can achieve a complete mechanism of plug-ins and templates. Ultra low CPU and memory usage, the highest performance play host to. 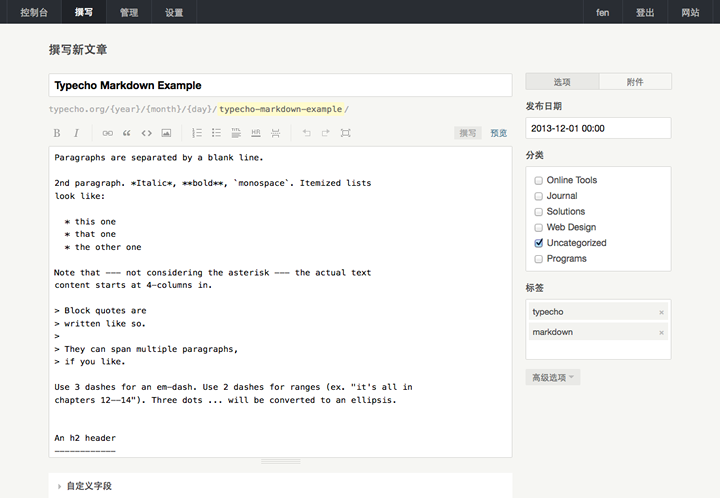 Native support for Markdown typesetting syntax, easy to write more readable. Support BAE/GAE/SAE and other cloud host, even in the face of sudden high traffic, can easily cope with. Carefully polished interface, you are still familiar faces, a more mature and thoughtful. Cut each pixel, only from perfect further. Read the document, he will have a unique style into a website, waiting for friends of the "wow awesome." Typecho was showing her simple character, like a slim beauty that attracts you. The pursuit of the perfect user experience, pay attention to the information accessibility, the popularization and promotion of Web accessibility and awareness, Typecho will do better. As the Typecho and the original intention of trying to do, let us to express their own platform by typing, not doing much, but good enough, this is enough. 2006-2019 Typecho. All rights reserved..